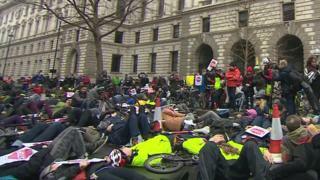 Hundreds of cyclists have staged a "die-in" protest in central London to raise concerns about road safety. Bicycles were wheeled down Whitehall to the Treasury by campaigners calling for increased government spending to protect cyclists and pedestrians. Five people - three cyclists and two pedestrians - died on London's streets in the past week. The Department for Transport said it was committed to reducing the number of deaths and casualties among cyclists. Nine cyclists died in London in 2016. Protesters have also been calling for a reduction in London's air pollution. Image caption Protesters rang their bicycle bells as they chanted: "Stop killing cyclists"
In front of the Treasury, campaigners laid down their bikes and dropped on to the wet pavement for a minute's silence. Co-founder of campaign group Stop Killing Cyclists Donnachadh McCarthy said: "We have had enough of the breadcrumbs - we need real spending. "We have had two tiny superhighways built, but they have been a huge success. "They are the germs of a revolution which should spread all across London." The campaigners want the chancellor to increase ring-fenced infrastructure expenditure on cycling and walking to 10% of the transport budget. Many attending the demonstration also wore gas masks in protest at the worsening air pollution. Ben Wales, 32, died after he was involved in a collision with a tipper truck in North Woolwich Road, Silvertown, east London, on Thursday afternoon. Anita Szucs, 30, died after an apparent hit-and-run on Bounces Road, Enfield, on Monday while architect Karla Roman, 32, was killed in a crash with a coach on Whitechapel High Street, Tower Hamlets, on the same day. A Department for Transport spokesman said: "Britain has some of the safest roads in the world but we are committed to reducing the number of cyclists killed and seriously injured." They said that on top of a THINK! campaign to improve cycle safety they were spending "£300m on cycling funding in this Parliament" and more than £7bn improving road surfaces.